Each year brings its own ups and downs and this one has certainly been an interesting one. From seeing a cow and calf moose on a regular basis when we went to see George and Marlene and later in January, rain and water running over the roads (which turned to ice), to having an absolutely glorious fall with very little snow and temperatures above zero most days IN EARLY DECEMBER it's been environmentally surprising. From a broke down truck at the start of the year to Marilyn's recent emergency appendectomy in December it has been a bit nerve wracking. I have felt very pleased to very anxious, delighted to overwhelmed. I'm learning to observe my reactions to situations, not judge them, merely note that I am happy or scared and it helps to make the situation manageable. I can make a note to self to do more or less of whatever I'm experiencing. My updates usually start with last year's Winter arrival and continue through the seasons until we are back to the present Winter Solstice. No one has scolded me unduly that there is a better way or that I should in fact make a Reader's Digest condensed version. However, if you'd rather skip the factual chronological items with the occasional silly story thrown in, go right to the end for the attitude of gratitude, just scroll down to the last few paragraphs where you will find my heartfelt thanks and blessings. Last December Winning Ways was blessed to have two great helpers with us for Fall/Winter. They are featured in a Blog I posted from the celebrations we held almost a year ago. Winning Ways hosted a Boxing Day Lunch for the Meed's Meadows (M's Ms) crew, then the McLeans joined us. Chris got his old snow machine out and entertained the girls with rides. We did some sleigh riding and lots of eating. At the end of December we were feeding calves, thawing water bowls and when I went to the abattoir, to pick up the winter's meat supply, the truck quit and wasn't fixed for days! Thank goodness for Brownie & his van! 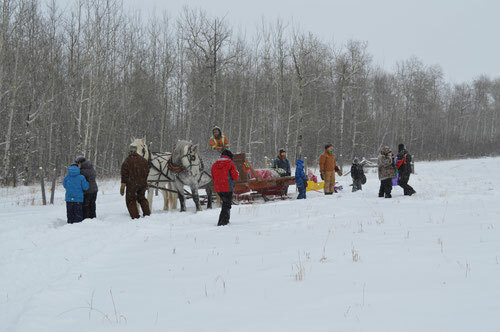 The year 2015 arrive with new snow on which we could enjoy our annual sleigh ride at the Two Bar C; Howard's team and our sleigh made a tour around the back 40 and had kids enjoying sleds and falling in the snow. January was occasionally cold but then it got unusually warm and there was water running in the creeks, down the ditches and even over the roads (culverts were frozen shut). We went for trail ride to the lake BEFORE it rained and the landscape became a skating rink. Writing about that reminds me that we went to the neighbours and the crew got to play shinny on their skating pond. At the end of the month it went back to being winter! 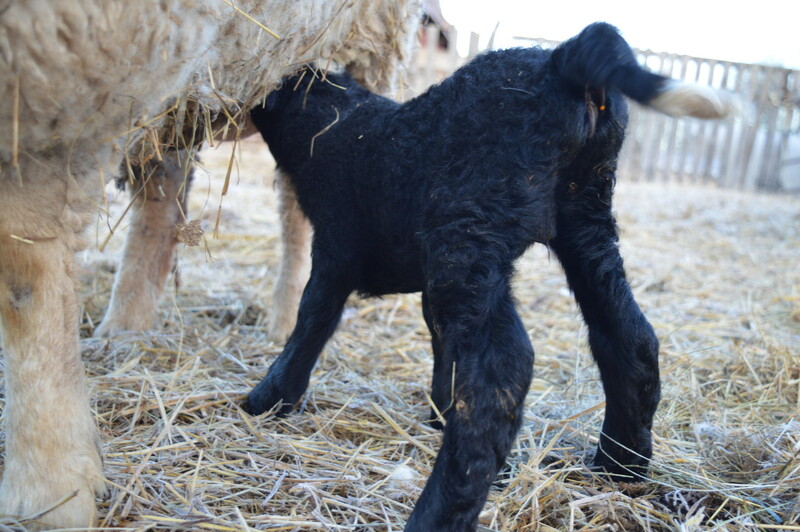 I can't remember if the Groundhog saw his shadow, but that day we were blessed with a nice black heifer calf--I had known about it's imminent arrival when the vet pregnancy tested, so I had taken the cow to M's Ms in January. One of the M's Ms crew and Marilyn's granddaughter got to watch the birth, much to their delight. The rest of February trundled along with some more cold spells and definitely some snow. Volunteers left and others arrived. We cut bale strings, fed pails of oats, chased cows once or twice and repaired fences numerous times--the usual ranch tasks. March came in like a LAMB! 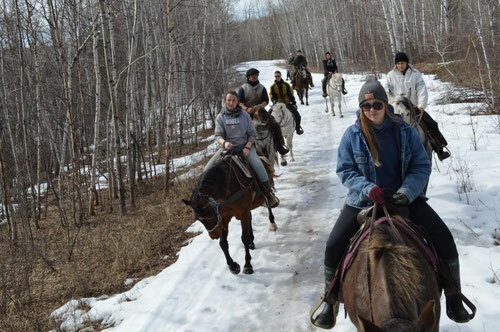 On International Women's Day (Mar 8) the weather was mild so we moved the cows on horseback and then the 8 riders went for a Trail Ride down to the Lake. I have noted that it was a good thing Marilyn/Smoke were the last pair through because there were places where the snow was up to Kosmo's belly! 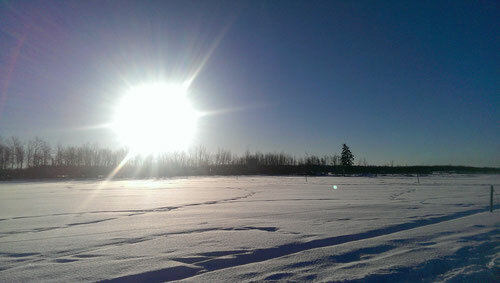 In the middle of March, Granny & I took a drive to Fort Saskatchewan to visit the McLean's. 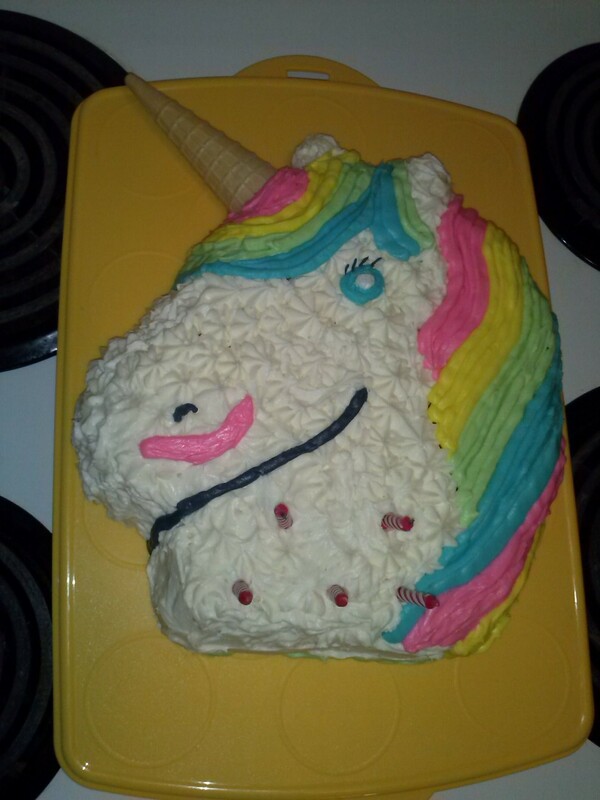 We helped to celebrate Elissa's 5th birthday, complete with a unicorn birthday cake. 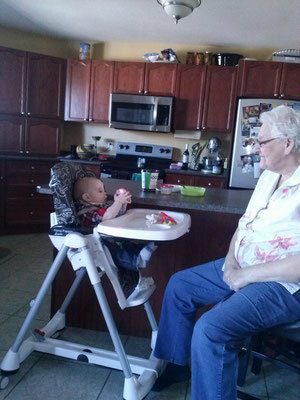 On the way home we also visited my great-nephew & his mom; Granny's first great-grandson was wide awake, played and let Granny feed him some lunch, much to her delight. On the Equinox (Mar 21) the helpers from M's Ms, Two Bar C and Winning Ways had an opportunity to play road hockey at the "Winter Festival" in Dorintosh. That's something most Europeans haven't done. 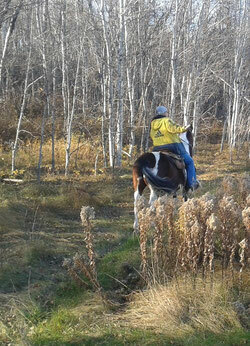 Again the weather was mild at the end of the month and M's Ms crew were over to help move the yearling heifers, so of course we had to go for another Trail Ride down to the Lake, this time over to the Old Highway and back home on it. That is the first time I can remember riding through the forest that early in the year. To ensure the safety of all our riders Marilyn and I updated our First Aid skills at the Community College during the last days of March. We don't have a heart defibulator but we learned how to use one! We brought the cows home in trailers on April 1, and put them out on the paddock on E7 from where they had started on their trail drive 4 months earlier. It was a nasty evening and the cows really thought we had played a nasty April Fool joke on them I'm sure. The ranch got decidedly busier from then on! The crew had to check cows morning and evening. 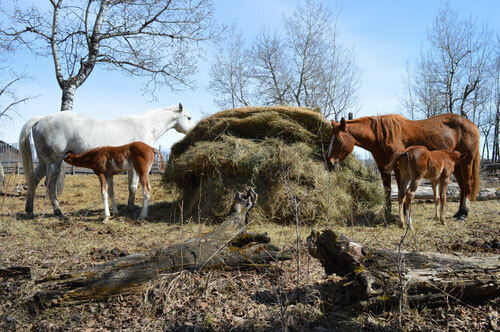 The two mares we had been boarding both had foals within about 24 hours (Easter Saturday & Sunday) and although the second one had a bit of a shaky start, it strengthened and was up running on the Monday. In between the foalings we had our Easter Dinner with the M's Ms crew at their place. I also acquired a rescue filly that weekend--Willow is a 2 year-old possibly Thoroughbred or Standardbred cross, that had been caught a few times to get her loaded. She was fairly frightened and it took several hours of my helpers time to establish any trust with her. Eventually she learned to trust and would allow herself to be caught and to follow where the helper wanted. Nancy brought the last load of bales home and used the Hyster to place them. 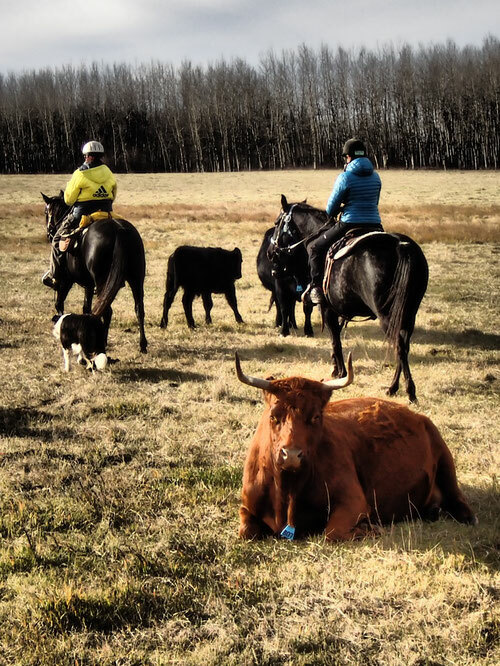 The crew was busy-- checking cows, doing ground training with horses, helping the Spring Break students learn about horse handling; but the crew had some fun too, watching a bonfire here and Bull-a-rama in Cold Lake. Finally after over ten days of checking, the first calf was born April 12! The same day the crew was treated to a rare view, a picturesque sunset with dancing Northern Lights in the sky! Land of Living Skies indeed!! 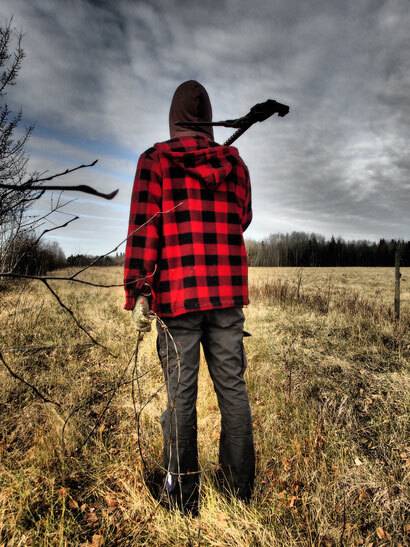 Nancy began her search for her own place--a little ranch somewhere in the Meadow Lake area. Brownie cooked us burgers on the wood BBQ (it was before the fire ban)and the crew enjoyed a bonfire. The 500-600# yearlings that I sold brought over $1900!! Almost $1950 on average. I have never seen prices like this before and neither has anyone else. The ranchers were elated with this situation but still rubbing their eyes like they couldn't believe what they were seeing. Finally the cows started calving and the crew was busy checking and tagging newborns. 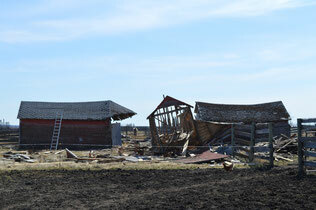 The old barn, that the crew started demolition on in 2014, was steadily going down. As usual we had a bottle calf (Bruce) to keep helpers amused and busy. 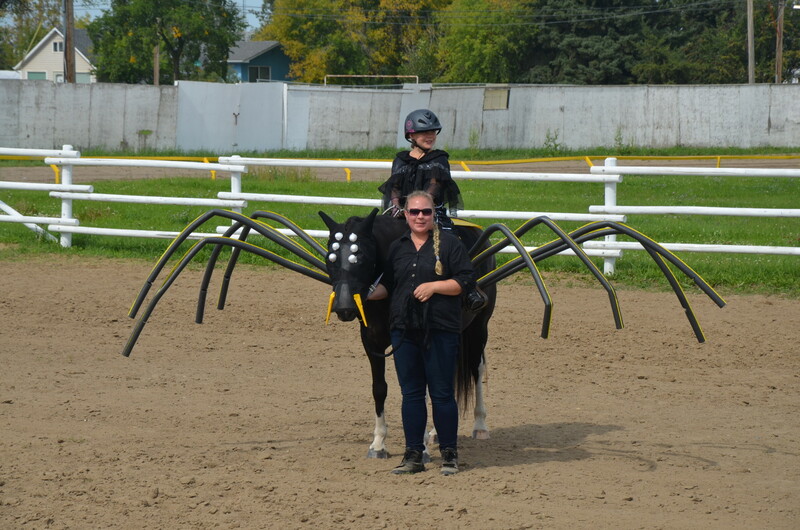 There were two groups of school children who came for AAL or regular riding lessons and they provided challenges and triumphs--temper tantrums and big smiles. The staff and volunteers that helped with these lessons always felt that they had contributed something to a child's life when the lessons were over. May Day, Vawn and her girls came for a long weekend break from the city and had an opportunity to visit with family and friends. Our first lamb was a day late for May Day, but he was sure cute! He was covered in glossy, curly black wool with a star and a tipped tail-- the crew settled on Haribo for a name. His mother, Fleckie, was not amused when he tried to suckle and so we haltered her and distracted her with oats so he could drink. That process went on for several days until one morning the crew found Fleckie dead! Possibly she choked on some oats. 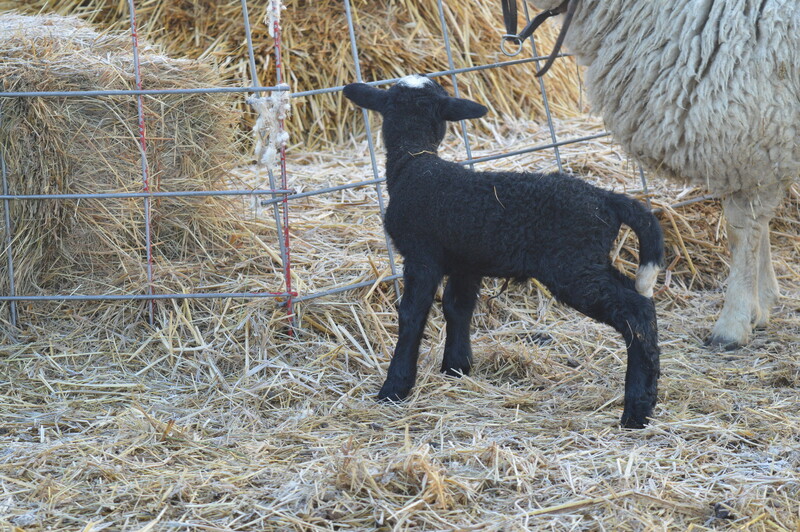 In any case, although Krafty had also had her little black lamb, Oden, a few days before, she was not feeding more than one, so we had a bottle lamb. Haribo quickly became a yard pet and would run to meet us whenever he thought he should be fed. So we had another bottle baby, Haribo; however, Bruce, the bottle calf, acquired a mommy when one of the cows had a deformed and DOA calf. That helped reduce the milk replacer bill! The Spring Series of Lessons had over two dozen students spread over 4 evenings and usually a couple lessons on Saturday. Lesson horses, helpers and Kelly were kept very busy and dogs spent a great deal of their time "sleeping in the trailer". At least if they were in the trailer, they were not "helping" Kelly with a lesson. 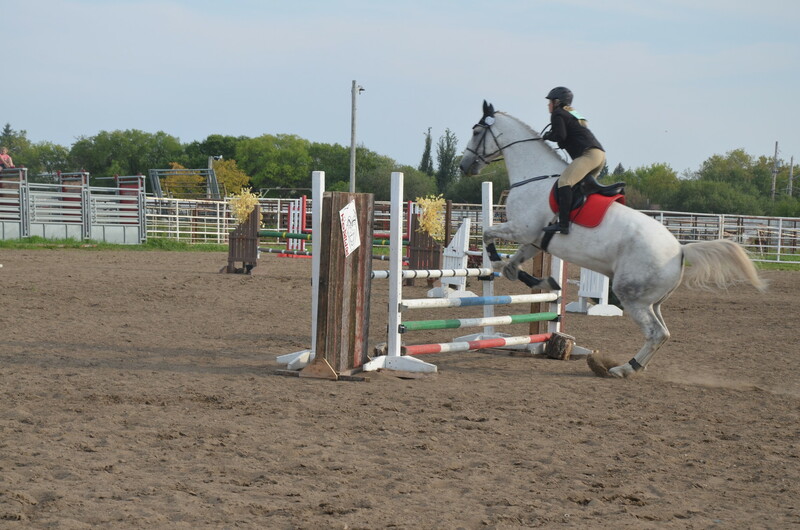 Cassidy on Shrek began her jump training and participated in her first Jumping Competition at the end of May. 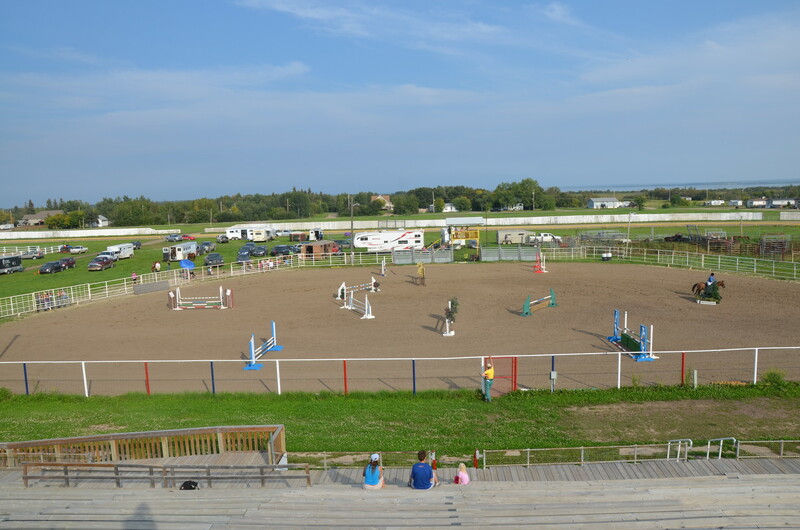 Other students worked on their Extreme Trail horses and ponies through the month of May so they could take part in the competition at the Meadow Lake Rodeo, on the first weekend of June. Our first branding in the middle of May, saw a large crew get the job done quickly so that we could have our supper early. 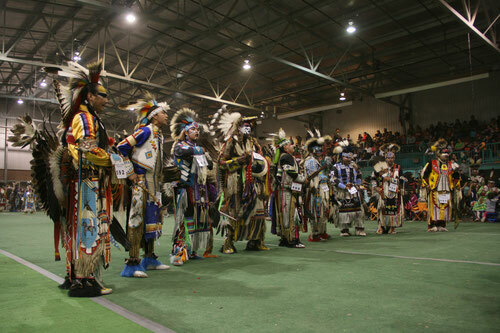 That evening many of the helpers were able to go to the Loon Lake Pow Wow, where they were awed by the costumes and dancing. At the end of that week we had a cattle drive and took the cows and calves to the North Ranch, of course M's Ms crew helped (they arrived before 6 AM!!) 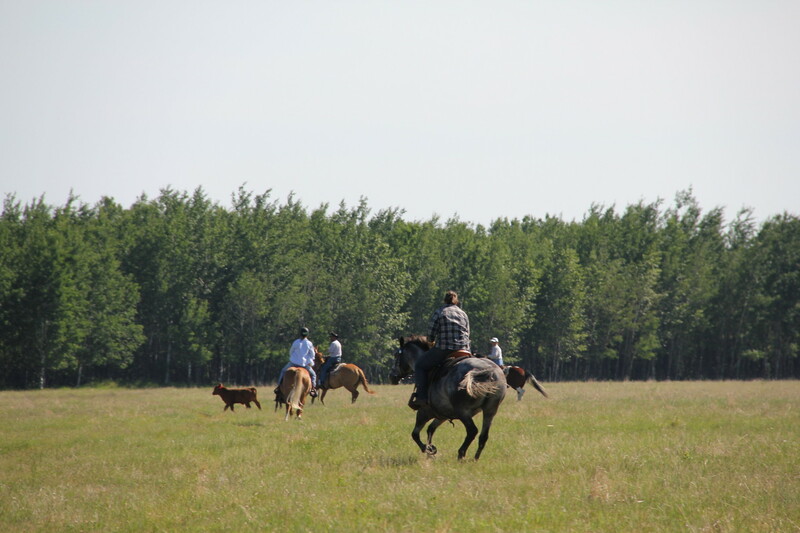 Although we took 5 hours (which is fairly long for our cattle drives) we did not have to load any calves. Everyone was tired when we got to the North Ranch and happy to relax. But ..... there were still lessons to teach and the trail course to be improved when the crew returned to the ranch yard. 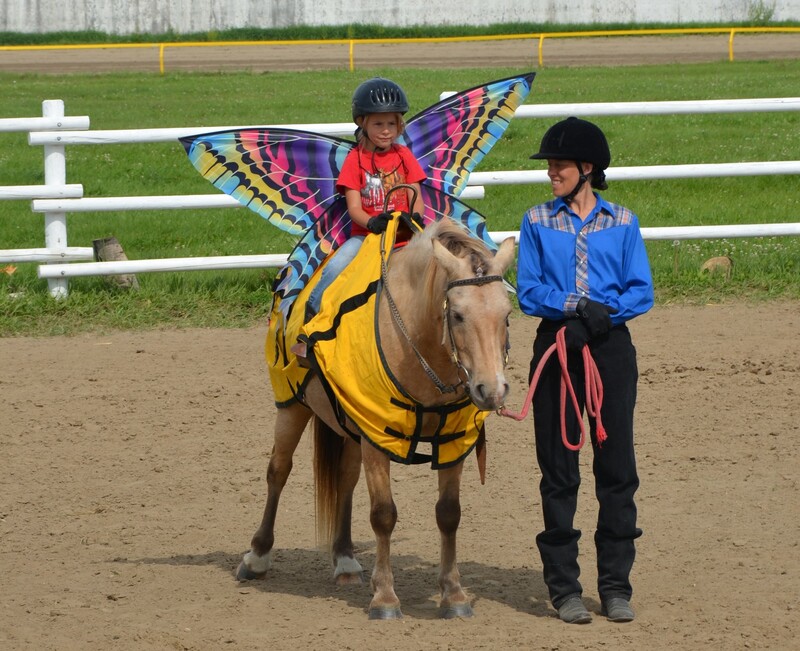 The next day we helped out with the Prairie 'n' Forest Club's Open House at the Stampede Grounds in Meadow Lake. 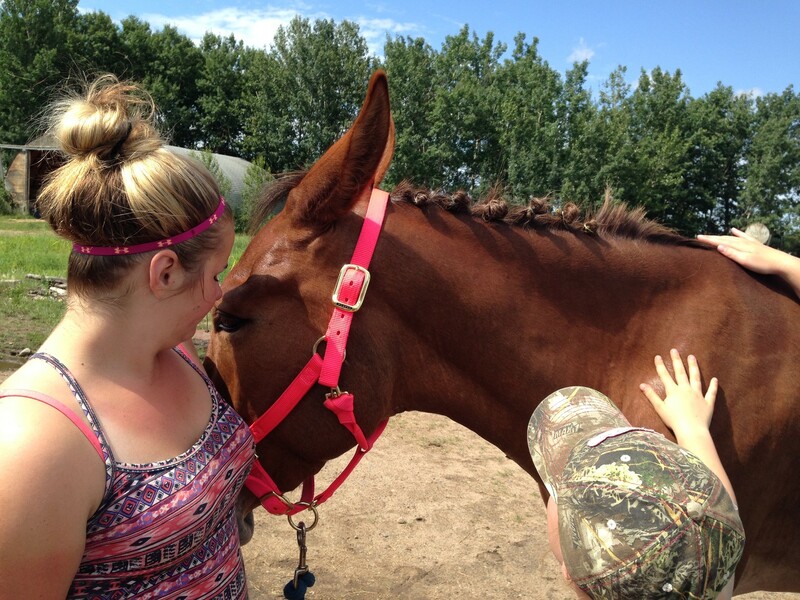 The town kids got to pet, brush and generally learn about the different equines that the Club had on display. Of course we took Teddy and Flash, who love kids. 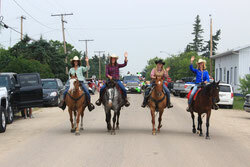 Winning Ways participated in the Meadow Lake Rodeo Parade with our decorated truck and three young riders. Although we were with the Prairie 'n' Forest Club riders (who were mostly M's Ms and Winning Ways helpers) there were the students riding with Kelly. The English style tack and apparel very nearly disguised me and several people later asked who that English rider was. Rodeo Week continued with the crew moving cows, going to the 4-H Show & Sale, tagging calves (even the hard to catch one), and having a Trail Ride at the North Ranch. Nancy was involved with the set up for the Rodeo since she joined the Rodeo Committee. The Winning Ways Kids all got their participation goodie bags and our Youth riders won some bling (shiny buckles) in the Extreme Trail Challenge Competition. The whole Winning Ways crew attended the first two nights of Rodeo (one of our crew even participated!) and I went back on the last evening with my Prairie 'n' Forest presidential duty of presenting the beautifully stamped halter (done by our own Renee Marshall) to the Miss Congeniality winner, Niceena Parsons. The next day was Winning Ways Open House to celebrate National Horse Day. There were over a dozen 'new' kids out to have a ride, several of the regular students demonstrated their ability to negotiate obstacles and the whole sheep family escaped just for fun! That evening we had supper on the lawn with cats, dogs and Haribo! There was a blog post about our fun, please have a look. Canada Day saw the crew load up 4 horses and the decorator side boards for the truck and we headed over to Loon Lake for the Canada Day parade. Afterwards we went down to Jumbo Beach with M's Ms crew and had a picnic lunch. Later that evening a group of us sat in the Lion's Park and watched the stage show and fireworks put on by the city of Meadow Lake. I do feel blessed to live in Canada, where there is clean air and water, a fantastic amount of natural beauty and the folks are friendly. The environment was very dry at the beginning of July and rain in any form, even a short burst from a thunderstorm, was very welcome. Farmers and ranchers were concerned, the grass was drying up and very little hay (only 1/3 - 1/4 of the normal yield) was being harvested. I felt a little less worried because the North Ranch has been somewhat submerged for the last two years, so I knew there was swamp grass on it. The cows would have something to eat up there. But the price of bales had skyrocketed to $200/round bale! THAT was very alarming! Finally in the middle of July the rain came and turned our pastures and hay fields to green. Those who had cut a very poor first crop suddenly saw the grass take off and grow remarkably fast--enough to harvest a second cut in August, not as much volume as normal but very good quality. It also turned out that grain crops, which had looked fairly poor, had an approximately normal yield. The corn over at the -P Land & Cattle Co. where the cows are wintering also grew amazingly and had a very good yield. 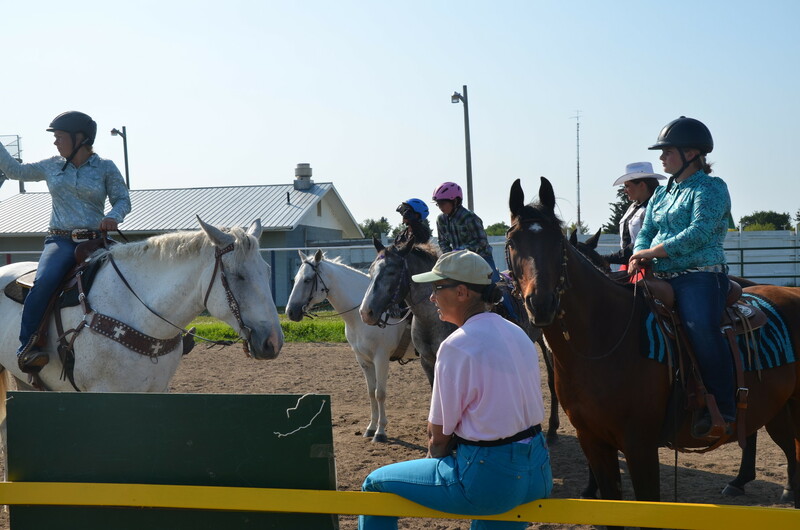 Winning Ways' Stampeder's Camp for beginners, during the second week of July, was a success with 11 riders participating--learning about riding and horses. 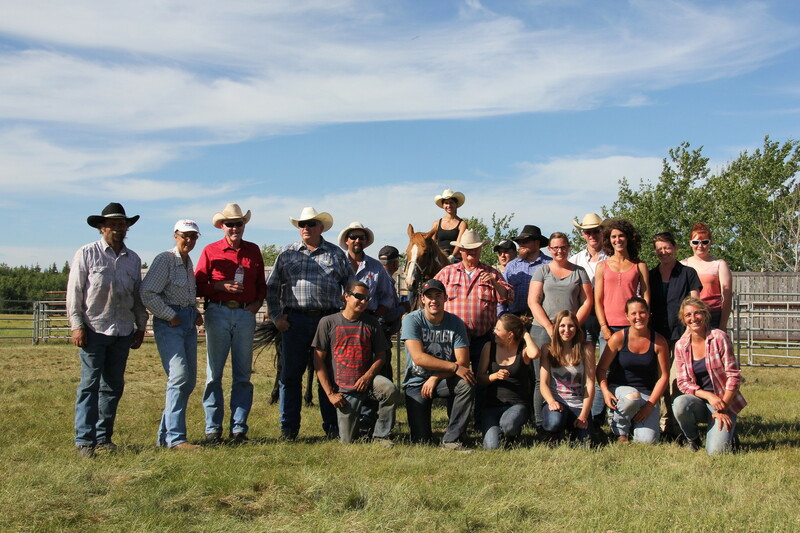 July 13--The crews from Two Bar C, M's Ms and Winning Ways went to Fort Battleford to watch the famed RCMP Musical Ride. Unfortunately for us we had double dared the environment to RAIN and IT DID! (None of us had taken a rain coat, we never even thought of clouds in the sky, it had just been so dry!) We got thoroughly soaked and the poor riders didn't have an opportunity to warm up their chilly/wet horses so we saw more misbehavin' horses in that one presentation than I have seen in all the many years I have watched The Ride. Roughriders Camp this year was 2 X 3 days so Vawn and I had six consecutive days of teaching. 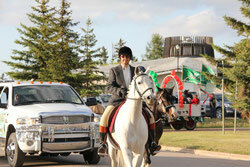 One day we had 17 riders so we had to find 17 suitable horses for those riders. We used all of the school horses, some of the ranch horses, show horses, and numerous ones we borrowed from M's Ms. 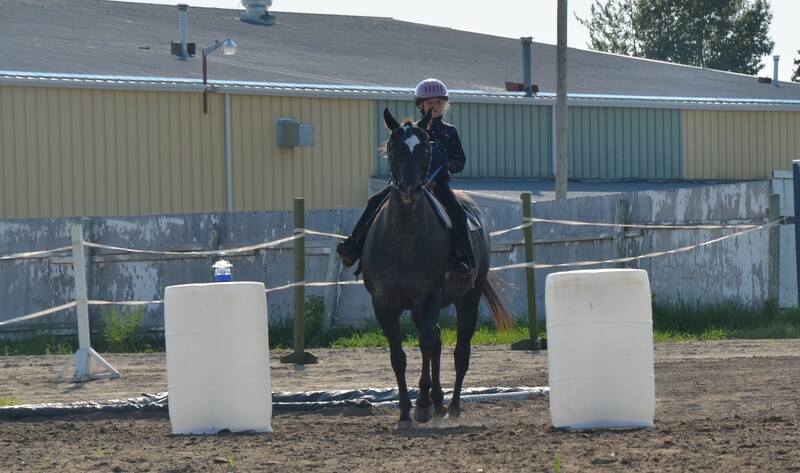 It was great to have a couple of helpers who were experienced with campers and keeping them occupied when the campers were not riding or in a theory class. My niece, Amanda, managed to step on a nail and I learned that I need to have a backup plan in preparation for when a student might have to go to the emergency room. The nurse was kind and made sure Amanda got the required tetanus shot. Winning Ways held a Summer School program for 8 students the last week of July. They had missed the earlier Stampeder's Camp so we had several little ones and their older siblings riding in the mornings for another week. My niece returned to the ranch for the long August weekend and had more adventures (of the good kind) riding at the North Ranch and Trail Riding. 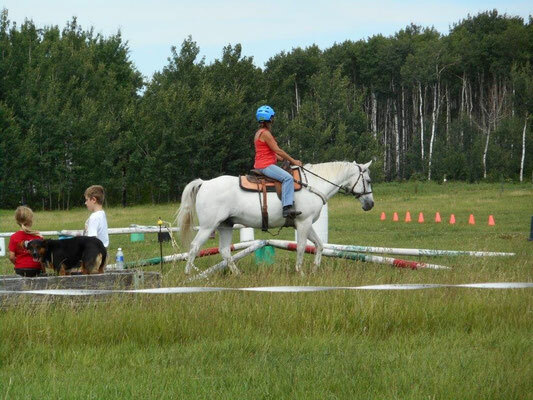 I took Marilyn on her favourite Trail Ride--The Blueberry Patch when the berries are ready! 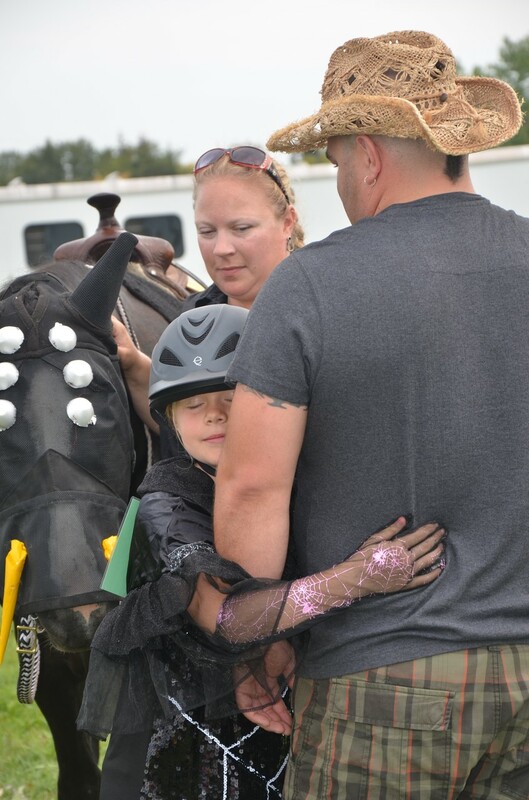 Cassidy competed in another Horse Show at Ebon Stables, at which I coached her in the mud and rain. Not much fun for horse or rider. 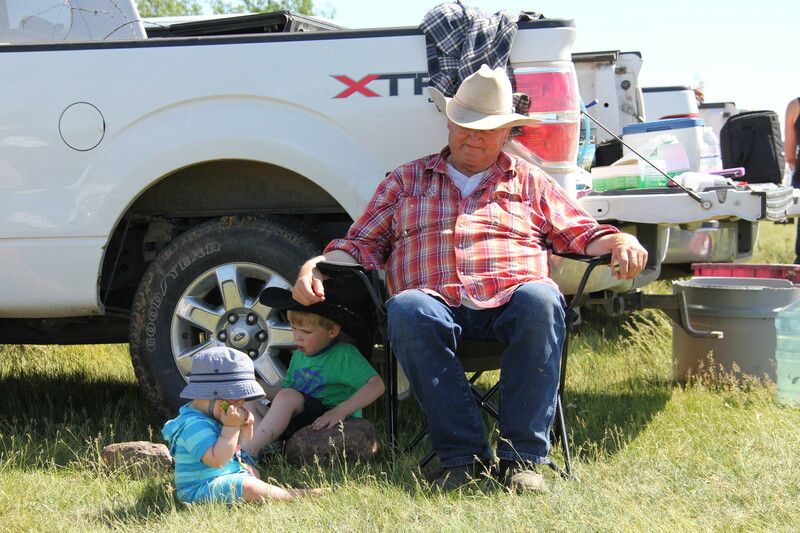 Immediately after I returned from Saskatoon, I packed up M's Ms trailer, 2 helpers from there, 4 horses and all the tack I needed for a 3 day Youth Camp at Ill-a-la-Crosse with Howard MacCuish. We did look after the cows all summer, thanks to helpers who enjoy working with the cows. There were -P cows here at the Home Ranch to keep an eye on, as well as, the Winning Ways herd at the North Ranch. In between, helpers fixed fences, continued on the barn demolition, created jumps, cleaned and organized, rode horses, fed Haribo, and occasionally got to do something off the ranch like going to 'tosh for Steak Nite or have lunch at the Annual MLS Appreciation Day. Toward the end of August, part of the crew, with some help from Tara, took care of all the critters, when Kelly took the girls to Hidden Meadows Show in North Battleford. I think Cassidy had fun there and I know Hannah definitely enjoyed herself. The last day of August, after the McLeans left to return to school in Fort Saskatchewan, a part of the Winning Ways crew headed up to the Provincial Park. We rode with Howard at Tall Timber Trails for 3 hours past 4 lakes and ended up with a wiener roast at the cabin when we got back. I think the highlight of the day (or perhaps evening) was when I sent a helper off to change the gates when we returned from the Park. It was dark, but there was moonlight and he was so proud that he got to go by himself out into the fields. Several of the helpers had to leave September 1, so over a couple days there was a huge reduction in the population at Winning Ways. Over the summer Nancy found a property that she liked. It is on the east side of the Makwa River, beside Highway 55 just outside of Rapid View. She put a bid in on it and bought it. That meant that at the beginning of September she could move into her own place. She fixed up the little house and moved her critters over there. (Except her ducks, who still live in the barn at Winning Ways.) Not only did she find herself a new home but also a man. She lives at her little ranch with Grant, Zorro, Lotta, her cow (who's going to have twins) and several other cattle. She still works at Home Hardware, truck driving and helping customers in the yard, occasionally she gets an inside job. 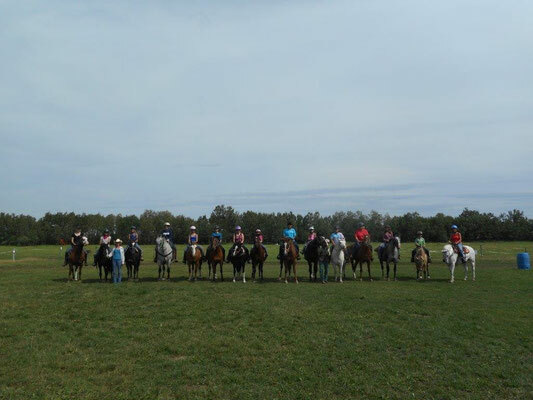 The first weekend of September we organized a Trail Ride with 16 riders. Part of the ride went completely around Nesset Lake, through what is now known as Mule Crossing from an earlier excursion with that equine. Previously, the mule thought she would never make it through the boggy spot and sorta laid down and gave up. 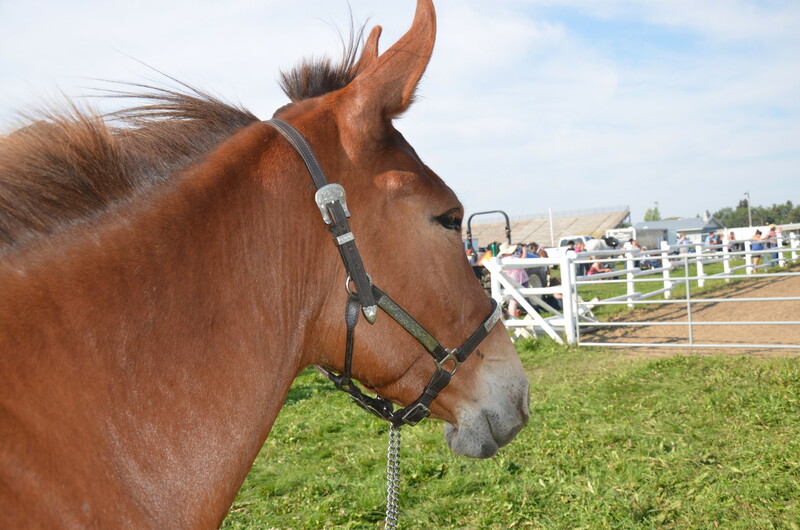 Once upon a time I was told that mules are sure-footed creatures, capable of traversing most anything. Well, my experience tells me that I'd rather trust a sure-footed old Appaloosa any day! Just sayin'! The majority of the riders went around the south end of the lake and up the Memorial Trail, only they had to cross the bridge, or not, (just walk in the water is safer for some) to get back home. A few alarmed horses and riders but no injuries at either end of the lake, just a good spattering of mud. 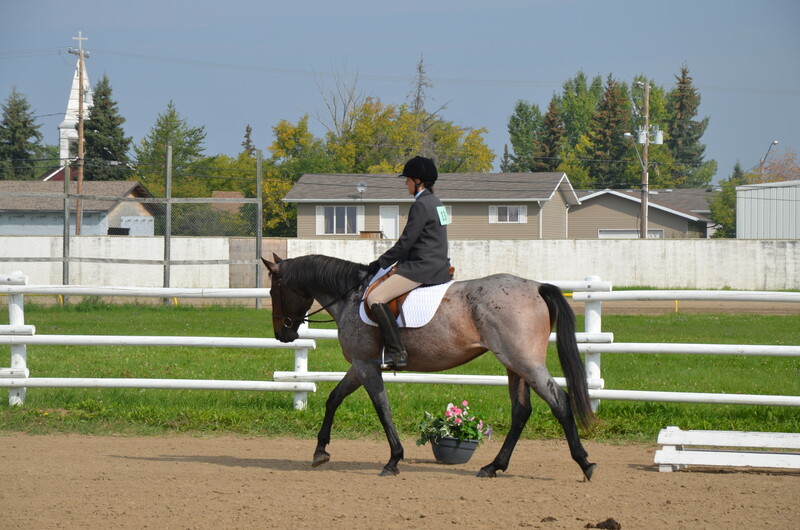 I went to see the Spruce Meadow's Masters competition in Calgary with Cassidy and the Fisher family. 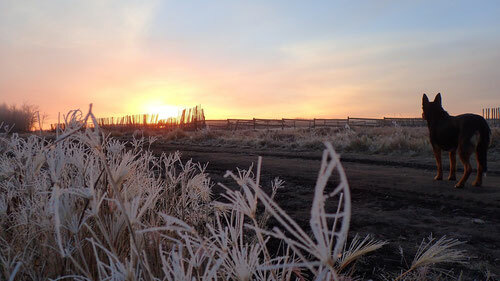 We had some misadventures (the truck broke down just on the outskirts of Calgary) and lots of exciting experiences. We got to see the 5 Bar competition as well as watch the Brazilian team win the Nations Cup; unfortunately we were on our way home when Scott Brash won the Rolex Grand Slam and earned a €1,000,000 bonus on top of the $500,000 cheque the winner of the CP International receives in prize money. 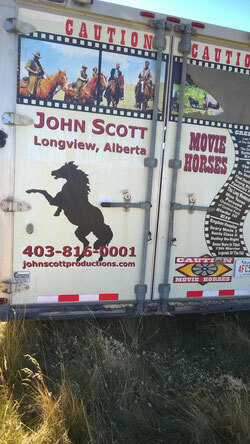 We got to watch a movie being filmed at a "western town" movie location and looked at the famed diner in High River where "Heartland" is filmed. We went shopping ..... we didn't sit still too often. Fall Lesson Series had us busy with around 30 students coming for lessons every day but Friday and Sunday. The rest of September was busy too--I don't know where we found time to do everything! The Prairie 'n' Forest Club held a Play Day with team games, even Marilyn and Kelly got to play. The Winning Ways crew went to M's Ms to help them trail drive their cows back home. 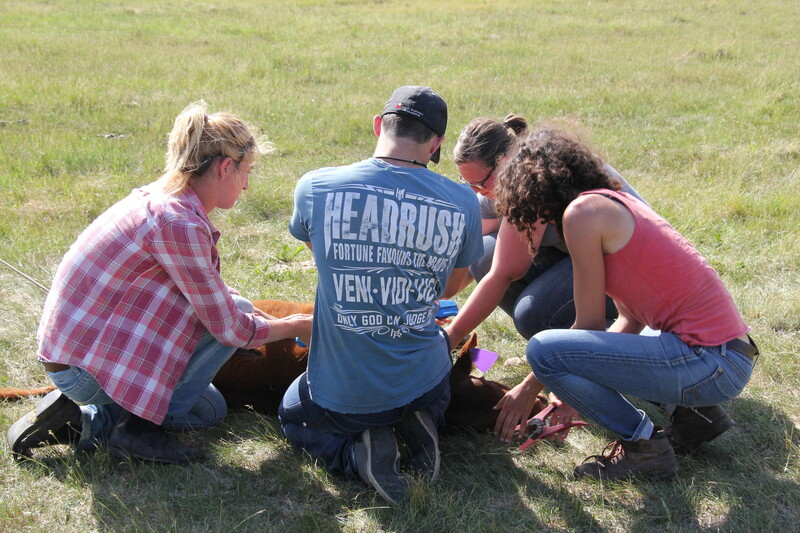 Later we went to the Two Bar C and helped with the round-up, sorting and their heifer pregnancy check. We moved the herd at the North Ranch down to the south end by the Highway Dugout and some fence-crawling calves caused us grief. On a couple of occasions we went and put them back in. Eventually the crew seemed to have found and repaired/tightened every little bit of wire where a calf could poke its head/shoulders/ribs/bum through! Toward the end of the month, the Land of Living Skies delivered once again--we watched the Total Eclipse of the Full Moon out the front room window!! Just a few days after we contained the calves we discovered that the cows had gone wandering to the east of the Double Dugouts so we had to do a little search and rescue to bring them back into the North Ranch. The Winning Ways crew helped out on a couple of occasions with hauling square bales at M's Ms. In return we brought home a couple of loads of bales which were a real boon later in the fall. Although October was not all that cold it was certainly fall-like and the riding students began to feel the chill in the evening. We finished the Fall Lesson Series by the Thanksgiving long weekend. A day or so earlier Kelton arrived in Saskatoon where he visited with his cousins before catching a ride north with Tyson. He arrived at Winning Ways about the same time on the Friday as his sister and her family. On Saturday we had a family trail ride, just my two children and I! I cannot remember the last time we 3 went riding together just to look at the lake and visit. We had a big celebratory feast on Sunday with 24 hungry souls digging into the turkey and the rest of the "potluck" meal that had been created. On the Monday the McLeans left with their menagerie--4 cats, 2 dogs and 2 bunnies, as well as some bits and pieces they had stored here when they first went to Fort Saskatchewan. They had found and rented a small property with a big back yard in which they could have the animals, even a horse. The crew put special emphasis on finishing the cleanup of the old barn demolition site and created a huge wood pile that I hope will make a wonderful bonfire. (That will be in next year's update.) The guys worked at it for many days sorting through the wood to salvage many pieces that could be repurposed. There were also the shingles to be placed as "asphalt" around the watering bowl. The remaining part of the old barn was used to store the wood that was to be recycled. Another group of helpers really worked on cleaning and organizing the recycle shed and that project saw many bags of recycles head off to Meadow. The calves were trying our patience again with their fence crawling antics. The crew was again dispatched to tighten fence and put in more posts. I warned the calves their days were numbered--sale day was fast approaching! While Kelton was at the ranch he did many maintenance and repair jobs. He also brought home the water tanks from the old Rapid View hay paddocks, which was an interesting sight to see! 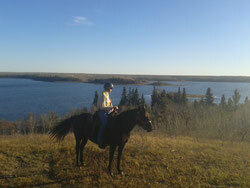 We went on a Trail Ride to Look-out Point at the north end of the lake where he had never been before. He helped when we sorted and loaded the -P cows to return them to their home pasture. I believe this year he enjoyed riding at the ranch, maybe he likes my new horse, he rode her several times. When it was time for him to return to Saskatoon, I took him down in the Jag (the story of which would fill several pages). While the car got a wheel alignment, we visited with Wendy and eventually she and I sent Kelton off at the airport. My crew was instrumental in helping me and others accomplish their fall tasks. They helped at -P with the sorting and pregnancy checking on several days. I and a couple of helpers worked on repairing and building a piece of fence at our old friend, Dr. Bacon's ranch. 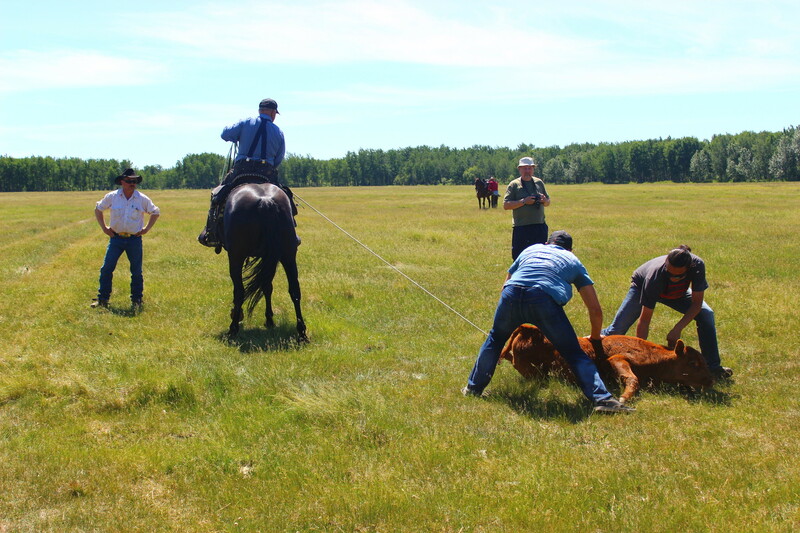 Of course we continued to help at the Two Bar C when it came time to round-up and send calves to market. 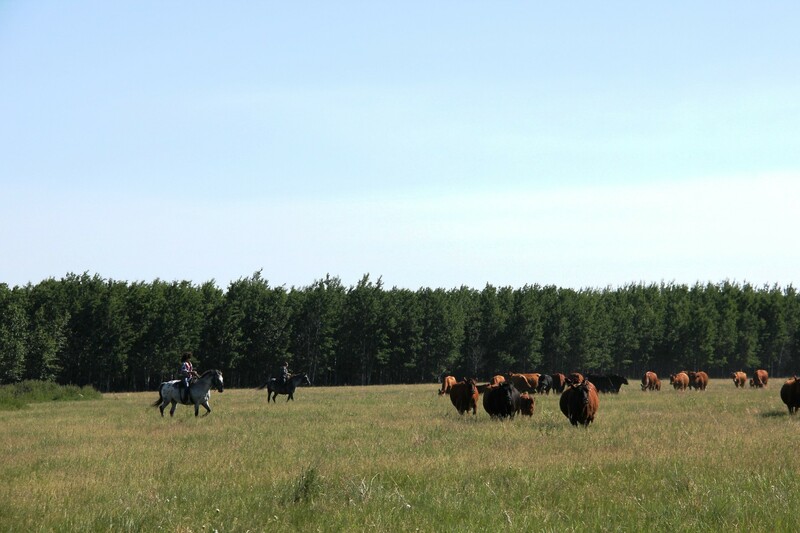 Both our ranches chose to send our calves to market the last week of October and it was a good choice. The market has been steadily declining since that time! Both George and I feel that we were good gamblers this year and were very pleased with the price we received for our calves. Last year at Halloween, the crew and I discovered the Haunted House in Pierceland. This year I encouraged Marilyn to go and she did on Saturday afternoon, taking Bruce, her granddaughter and her granddaughter's friend to be scared and scream wildly at the ghoulish and ghastly sights and sounds. The M's Ms crew and I and my crew went a bit later. After we'd had supper together (thanks again George), we also got to be scared and made jump back in revulsion at what was just around the corner or hanging in the dark passageway. I found that it wasn't such a psychological horror this year as last year, but still spooky and terrifying especially if you let your mind run wild. The Pierceland crew puts a great deal of time and effort into their show and it continues to grow in reputation. They posted pictures on Facebook of all the frightened faces who thought the truck was about to run them down. I merely looked disgusted with the light and noise, but it was effective on many people. A group of us--three helpers, Granny and myself--went to Edmonton at the time of the Farm Fair. Two of the helpers were headed off on new adventures after they had a look at Farm Fair and one of the guys caught a ride back with M's Ms crew that also went to look at the Fair. Granny was happy to hang out with her Great-granddaughters and I got to spend part of two days wandering around the Northlands Exhibition complex. Friday I was entertained by the Ranch Rodeo. The next day Vawn, Caslyn and I watched the stockdog trials until Caslyn got cold and we went off to see the numerous exhibits. On Sunday Granny & I went to pick up a horse for Tara and bring it back to the ranch. 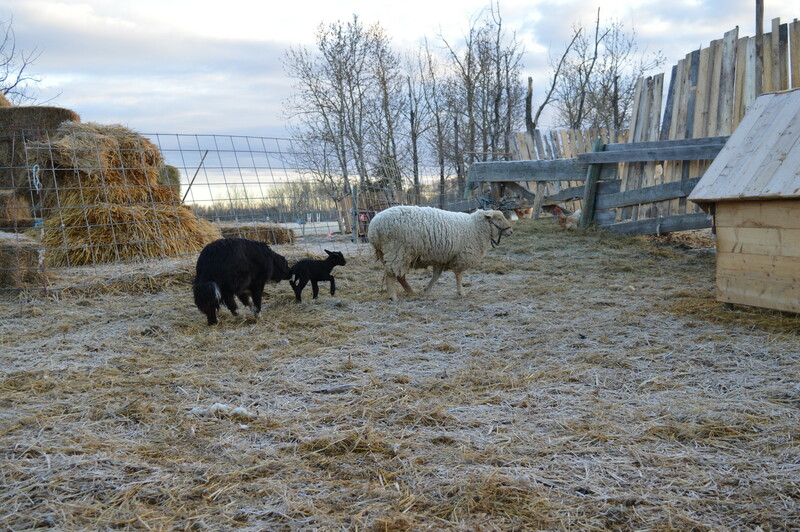 Since we had lost one mama sheep in the spring I wanted to replace her and purchased a black ewe lamb from our friends, the Millions. When we picked her up she was not impressed by being surrounded by a half dozen "predators", roped, picked up and put in a trailer with a COW! 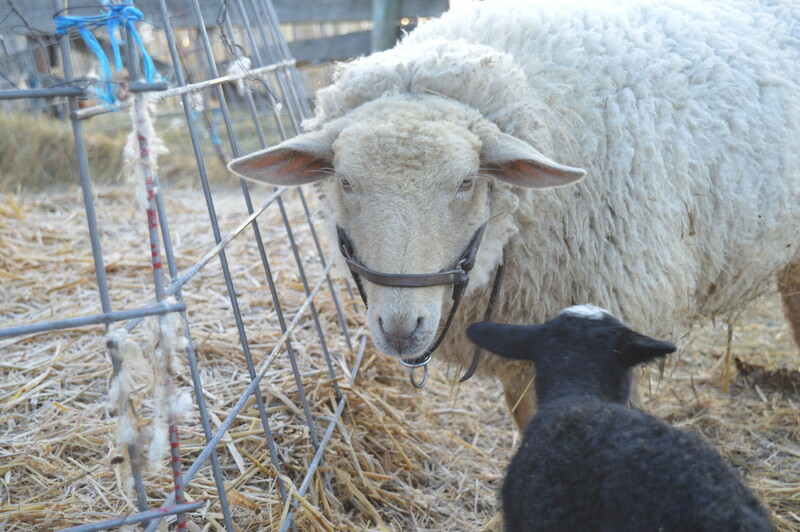 I told my Tasmanian helper that she could give the new ewe a good Australian name and so the ewe became "Shelia". Shelia has since decided that we are not such predators after all and comes and eats oats right out of the bucket. We brought the cows and remaining calves home Nov. 17 because we had a date with the vet to pregnancy check the cows on Nov. 19. The cattle drive went fine and we had no runaways, except one horse from M's Ms who was very fretful. 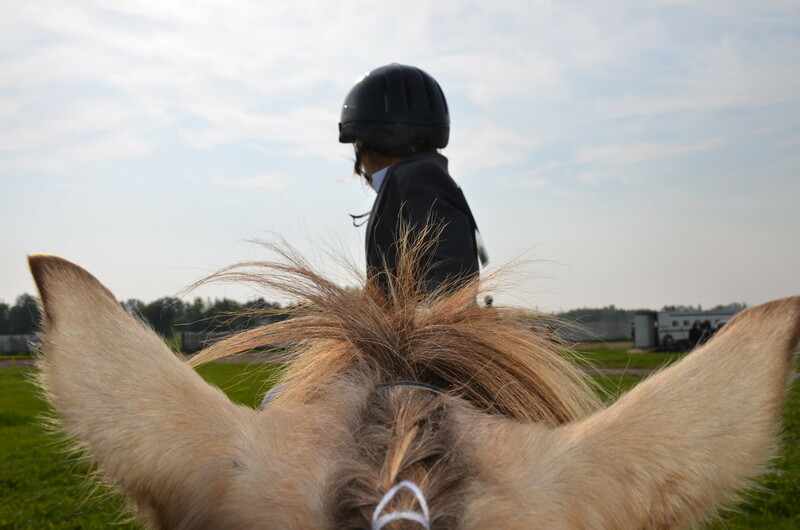 Although the mare worked well as the lead horse she was not a comfortable ride. There were several open old cows revealed by the vet's ultra-sound so they went to the Stockyards the following weekend. The remaining calves were weaned and Winning Ways was noisy with the bawling cows for a couple of days. We were able to feed the calves the good square hay bales that had come from M's Ms, so they were not nearly as interested in calling as their mothers were. We took a dozen calves over to M's Ms for winter feeding. I also took the cow that had calved in February, 2015 (because now she's predicted to have a New Year's baby) and a first calf heifer that the vet thought might calve in March. 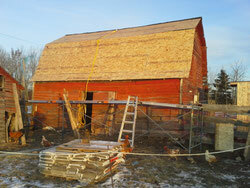 When Kelton was home in October we had discussed reshingling the barn roof. Since we still did not have much snow in the second half of November I hoped we could do at least the south side of the barn. I went to Home Hardware and got the necessary materials and we started on the project. It took a couple weeks to tear out the old rafters and replace them, put on OSB, roofing 'paper', and then the shingles. There were other exciting things to do in the mean time, so it was not a completely concentrated effort. The crew rebuilt the barn doors and now the rain/snow deterrent for the south side of the barn is complete. The cows went on another cattle drive to -P Land & Cattle this fall. We had the cows sorted, tagged and ready to go by lunch time. However, this time our cattle drive was not so effortless. The cows balked at going down the trail to the lake and only Brandy's fleetness through the bush averted their efforts to resist the riders pushing them to the east into the trees. Then on the far side of Hog Island, whether Louvic inadvertently chased the lead cow or she just took a notion to go home, the whole herd turned west and headed UP the hill. Again Brandy plunged through the fallen trees, intent on turning the cows back, when they did go back, she plunged down the hill just as fast as she'd gone up. Remarkable little horse since she was carrying me and many pounds of tack. George had thought it wise to join us, to warn traffic from both directions, when we crossed the Highway by Nesset Lake. Marilyn was our truck driver throughout drive and kept vehicles from our path when crossing the bridge on the Highway. At the bridge, the cows again thought about deviating from the plan but soon Louvic's sharp teeth urged those headed in the wrong direction, back in the right direction. When we reached the gate at -P, we had to wait a few minutes while the cows inside the field were fed, so that we could open the gate to put our cows through. The half dozen riders were fairly cold by the time we reached the yard site and dismounted. Everyone was grateful to climb into a warm truck. The second last weekend of the hunting season brought my brothr-in-law, Fritz and nephew, Dylan, to the ranch to go deer hunting. I told them that if they saw a particularly fat one, I had my name on it. I even went out and pushed bush for them on Brandy, but I'm not sure if I helped or hindered. The deer I saw moving, were going away from the hunters; however the hunters circled around and eventually got a nice fat doe. The next morning they came back and got a second one!! I was gone that day so I never even saw that one. 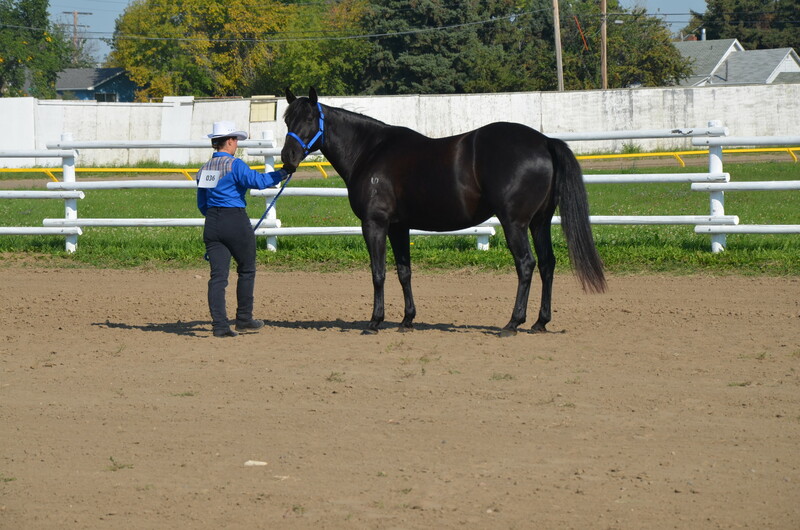 That was the day we helped at the Two Bar C to round-up, sort and pregnancy check. The calves were also weaned and ivomeced. After the vet was finished I helped to haul the open cows to the Stockyards. George had some "early" calvers according to the vet, so I hauled them over to M's Ms the next day. That way, the "early" calves would have a warm barn to go into, if they needed it. The following day, Tuesday, I got a phone call at lunch time that completely confused me, I could not initially hear/understand what was being said. "Marilyn is in the hospital and they are going to send her by ambulance to North Battleford Hospital to have a scan. She was in real bad pain overnight and we brought her in to the hospital a little while ago." But......she was perfectly fine last evening when I was there....how? why? 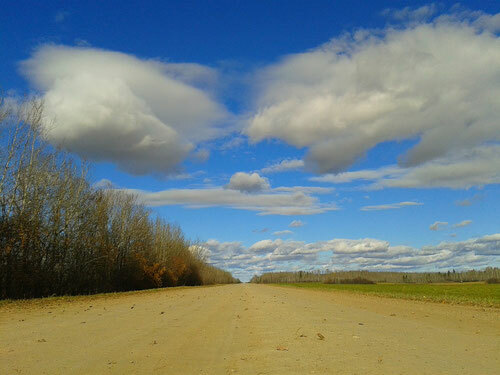 When I finally could understand what I was told, I said that I would go to North Battleford. When I met Marilyn at the NB hospital, the ML ambulance attendants were still with her and they told me that the doctor in Meadow Lake had given her morphine! While she did not look extremely ill, I could see she was still in pain after having received morphine. That, I found alarming. The doctor came along and told her that he thought she had a very inflamed appendix and that he was going to operate immediately. He also said that he would have to wash out the abdomen very thoroughly to make sure all infection was cleaned out. More alarm bells! The nurses were in a flurry to get her ready to go to the OR and shortly a nurse came to take her there. I went for supper and when I returned I met the nurse who had transported Marilyn to and from the OR. She told me that it had been an appendectomy and that Marilyn would be placed in her bed and shortly the nurse would come and get me. When I saw Marilyn she told me the doctor said her appendix was rotten, I think he meant that it was no longer in one piece. She seemed cheerful and the nurse said that sometimes people were released in 24 hours. I took a hotel room for the night and the next morning when I called, Marilyn told me the doctor wanted her to stay since she had an elevated blood count--infection was high. I said I would visit her and then go home. The next few days I talked with her and she seemed to get worse, between the infection and the high powered antibiotics she felt miserable. Finally on Sunday morning she said the doctor told she was ready to go home, so Bruce went down and picked her up. Thank goodness she has made steady progress to recovery since returning home. Last week when I took a couple of M's Ms horses back, I took George and Marlene and their helper along to visit Marilyn and Bruce. George was delighted with his two calves "Red Bull" and "Peaches". Remember those early calvers I took to M's Ms on the Monday? Well two of them calved on Wednesday, the second day Marilyn was in the hospital. They have an educationally enriched environment at M's Ms, the pen the calves are in, has a tether ball for practice head butting! There's a picture on Marilyn's Facebook page of the cute calves and their toy. We took along some food and joined the M's Ms crew for supper and enjoyed a great visit. A couple days later, I had a lunch date with Nancy before she flew back home for Christmas. I read on Facebook that she made it to Europe and even got to see Lea in Bremen. All fall I have been hearing this from folks I meet on the street or in the shops, "How are you doing?" My reply, "I'm enjoying fall! Its been just beautiful weather!" Their faces would instantly light up with a smile and they would agree that indeed it has been great. Every time I saw those sometimes grim or grouchy faces change to all smiles I felt good. Just a few words and folks suddenly remembered they had a reason to feel good. Note to self: see how often my words can make a positive impression on those around me. I've told a you some of the adventures that happened here at Winning Ways in 2015. A few of the stories are in more detail to hopefully give you an appreciation of what my life is like. What I've omitted thus far, is explaining that I feel very blessed to have met so many great friends from all over the world during this year. Helpers who arranged their stay here many months in advance, volunteers that suddenly discovered they were looking for a different host and found me, visitors who were recommended by friends and family to try our hospitality, friends that returned for yet another opportunity to experience Winning Ways, parents and grandparents who asked for lessons for their child, riders that wanted to grow their confidence, teachers who felt that Winning Ways could offer so much to their students, all these folks are my friends--how blessed I am! I also know that I am enormously grateful for the friends that I have known for many years and with whom I enjoy so many adventures. When visitors leave they generally do so with a small photo as a reminder of their stay here. Usually I write a Thank You note on the back. Here are a few lines that I have written this year. "We enjoyed your brownies, your enthusiasm, and your love of animals; we admired your quiet fortitude when you were hurt. We know you have stretched, endured, achieved, laughed, cried, cheered and grown immensely since you came here. You will have friendships that will last a lifetime." "Your willingness to try anything and friendly nature are fine qualities. I hope that ranch life has not been too hard on you! Thank you for entertaining us with stories about your life at home. Hopefully the hours spent in Saskatchewan will be remembered as some good times!" 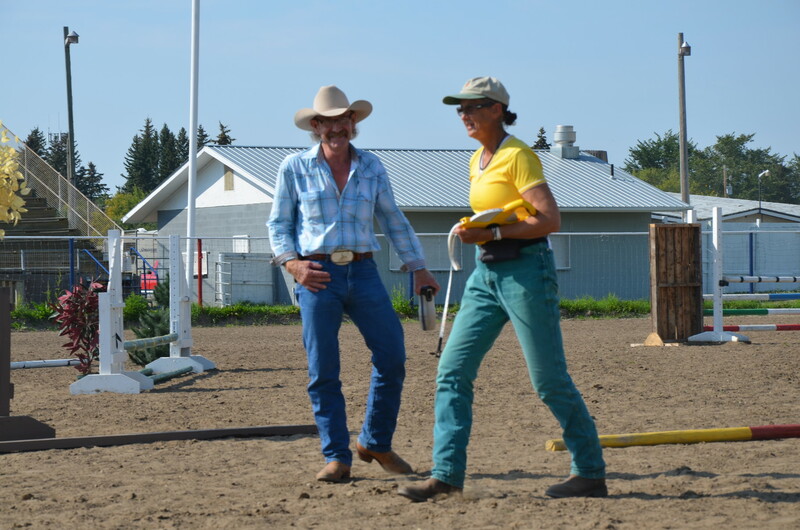 "I was so happy that I could depend on you to take care of so many things around the ranch w/o having to give detailed instruction because you knew where to go and what to do." "Your good humour, smiles and laughter even in stressful situations made it a great pleasure to host you. I appreciated having enjoyable conversations with everyone. I look forward to your return! You are welcome back." Recently I read "Wisdom is the real deal!" I think the author was telling us that an enriching experience, that has taught us something, will lead us to choices that help not hinder us. I am so grateful for the multitude of moments that have been my world in 2015 where I learned and made a helpful choice. Whether it was to get up early to watch the sunrise and help deliver a calf, help a friend who was stranded, massage a horse, invite someone for a cup of tea, plant a tomato, listen to a child's story, enjoy a piece of gift chocolate, watch a new sight or an old one with new eyes, listen to the wind in the trees, the list is endless. I hope to continue down the road of life with many friends with whom I can enjoy making helpful choices. I am truly learning that whatever perspective I bring to the situation is what makes the world a bad, a good or an amazing place to be. Observing my reaction to a situation and not being judgemental of the reaction is actually a learning experience. All that "thinking" that goes on in my head is what can get me in trouble or bring me to an amazing place. I will choose the amazing place! I thank each of you that has joined with me during this year, either virtually or in reality, for your friendship. I ask the Creator to bless each of my friends with the truly important gifts of love, friendship, health and abundance throughout the cycle of seasons. I also ask for blessings on all our four footed friends who show us love, devotion, motivation, relaxation, mothering, and a multitude of other virtues.